One thousand years ago, ocean explorers mapped the seafloor by dropping a marked line with a weight at the end. One hundred years ago, the first modern ocean scientists started to develop the concept of echo sounding to use underwater sound to measure the distance of the seafloor directly beneath a ship. Fifty years ago, physical oceanographers began towing units and mounting sonar systems that could see in more directions than just straight down. Twenty years ago, the first tethered and autonomous robots with the most simple propulsion mechanisms were being introduced. Today, we have the Project Recover Tech Squad! 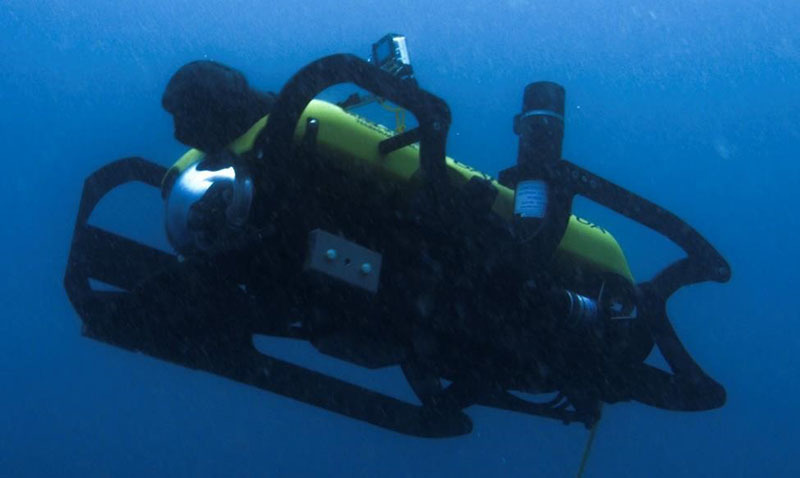 Our team has a lot of human talent, but the real workhorses on our team are the various state-of-the-art robots and sensors that the Project Recover team has acquired and modified for our survey work. So without further ado, it would be unfair if we didn’t give them their credit. At point guard, standing 7.5” in diameter, here comes our autonomous underwater vehicle (AUV), BIPOLAR! 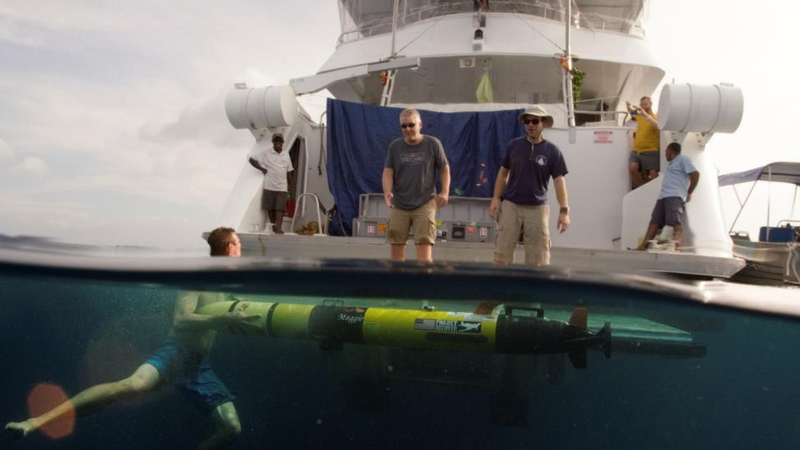 Bipolar is the closest variant to a classic REMUS 100 AUV, but outfitted with our state-of-the-art sidescan sonar that is on all of our vehicles. Bipolar is our only East Coast native, hailing from the University of Delaware. She also happens to be our most traveled vehicle since getting her name from having visited both the Arctic and Antarctica. Bipolar is sleek with minimal battery consumption and can run the longest missions for our team. Bipolar diving for a mission. Image courtesy of the Kiska: Alaska's Underwater Battlefield expedition. Download larger version (jpg, 152 KB). At shooting guard, filled with ultra-strong, nonmagnetic titanium components, clap your hands for MAGGIE! Maggie gets her name from specializing in running a “MAG”netometer module that measures disturbances in the Earth’s magnetic field caused by ferrous metals (such as iron or steel). 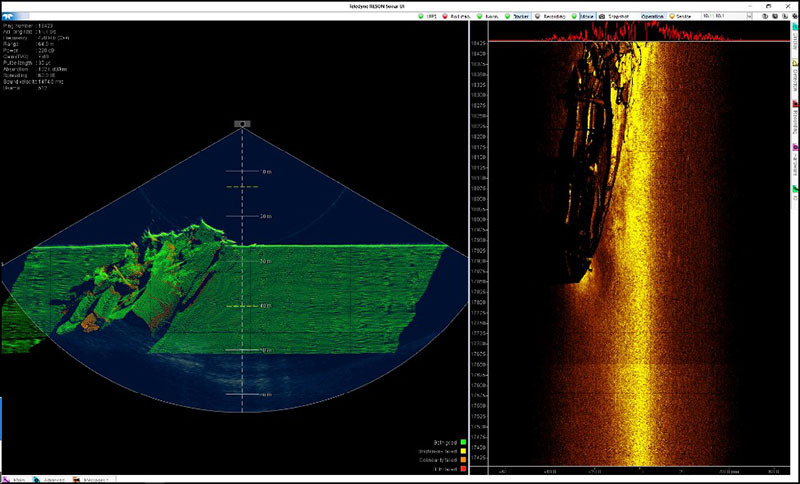 She also has very high-resolution sidescan sonar for extremely sharp imaging. After the front runners sweep large survey areas, Maggie tends to be used to reacquire targets for a better look and target identification. Maggie with her magnetometer module. Image courtesy of the Kiska: Alaska's Underwater Battlefield expedition. Download larger version (jpg, 190 KB). At small forward, humming his way onto the scene, shout out loud for TRIPLE DEUCE! TripleD, as he’s so fondly nicknamed, is a power hungry monster that shoulders the most capability of all the team members. Although he will not be the last out running, TripleD has extremely accurate navigation and is therefore best suited to operate multibeam and camera modules. When needing to attack small difficult survey areas, nobody is relied on more than TripleD. TripleD being launched. Image courtesy of the Kiska: Alaska's Underwater Battlefield expedition. Download larger version (jpg, 161 KB). At power forward, watch her brush the dirt off of her shoulders, welcome our biggest celebrity SCOUT. Scout is the first superstar from Scripps Institution of Oceanography to achieve the major upgrades and has been crushing Project Recover efforts for three years now. She has the most finds of any vehicle and has been the most reliable and trustworthy front line explorer. Although her brother and sisters are starting to gain fame, they have a long way to reach Scout’s resume. Scout awaiting her next mission in Kiska. Image courtesy of the Kiska: Alaska's Underwater Battlefield expedition. Download larger version (jpg, 131 KB). At center, unique to all the others due to not having any locomotion of its own, stomp your feet for the T50. The T50 is a boat-mounted multibeam sonar that allows us to accomplish the few tasks that our AUV fleet cannot do. When currents are too great, cliffs too steep, or targets too deep, we have no other option than powering up T50. With 512 beams painting the seafloor as our ship drives forward, T50 can produce high-resolution point clouds that show bathymetry. Check out this ship that we imaged yesterday! Shipwreck from Kiska imaged by the T50. Image courtesy of the Kiska: Alaska's Underwater Battlefield expedition. Download larger version (jpg, 395 KB). At sixth man, standing two feet tall, keep her on a tight leash because she’ll show you the deepest treasures, give a final shout-out for CUDA. 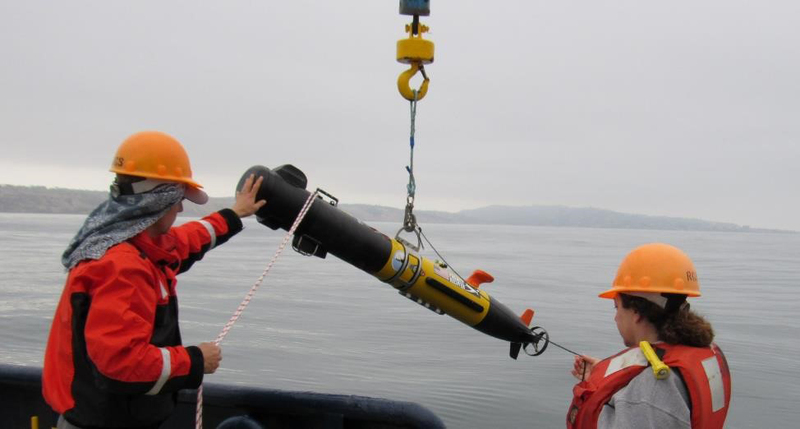 Short for “Barracuda”, Cuda is a remotely operated vehicle (ROV) that stays tethered but provides live video and sonar feeds to the Project Recover team. Always used as a final verification tool, she dives deeper than her human counterparts and can stay down for hours, exploring every nook and cranny of a target or wreck. Cuda is one of the most powerful two-man portable ROVs available and she routinely flexes her muscle towards the end of every mission. Cuda ready to record video. Image courtesy of the Kiska: Alaska's Underwater Battlefield expedition. Download larger version (jpg, 178 KB). Thank you for all the best wishes for our tech squad! May they fly true and stay healthy! Stay tuned for more exciting stories of the team as the trip progresses.